Big BIG FINISH Week: Doctor Who - THE JUGGERNAUTS Review | Warped Factor - Words in the Key of Geek. Tony Fyler keeps on trucking. Terry Nation was an extraordinary writer. Not just once, but three times in an otherwise largely prosaic and workaday career, he bottled sheer creative science-fiction lightning. In the sixties of course, he created the Daleks, a species of zeitgeist monster inspired by the real human horrors of the Second World War and tapping into the real and present mushroom cloud fears of a world that remembered the Cuban Missile Crisis and was taught what to do in the event of nuclear annihilation. His second, more serious streak of bottled lightning, in the mid-seventies, was Survivors, a story of pandemic plague and the realities of human pragmatism, stripped of all the niceties of comfort. And his third bottled lightning bolt, at the very end of the seventies and into the eighties, was that peculiarly British dystopian space opera, Blake’s 7, which married adult themes and casual brutality with the milk bottle-top budgets of the BBC. Each of these three ideas was enormously successful for Nation, and in all probability he could have rested on his Dalek-baubles after just one of them, but Nation was nothing if not ever keen to try and maximise the personal profit he could wring from any idea. The Mechanoids, brought in to put an end to the faintly silly but also oddly logical advance in Dalek storytelling that was The Chase, were Nation’s attempts to re-do that thing he’d done with the Daleks originally – create a completely alien killing machine that would sweep the nation and the world and bring him lots of lovely money. They never quite worked. In the first instance, they were enormous and unwieldy (even by Dalek standards), in the second place, their mode of speech, while perhaps being more in keeping with sixties robot development, was low, and irritating, and never even remotely threatening, meaning they had neither personality nor menace. In essence they were what the Chumblies aspired to be when they grew up. Despite some solid efforts on the part of the BBC’s PR department, they never swept the nation and they never returned to on-screen Who. Welcome to the audio medium. In Big Finish story The Juggernauts, the Mechanoids are back, and the audio medium frees them from at least one of their issues – they no longer shuffle about bumping into the furniture. What’s more, Big Finish tries to do a job that proved beyond both Nation and the BBC – they try to give the Mechanoids a sense of the body horror common to the Daleks and the Cybermen. In the storyline, they also try and stretch the Mechanoids, embodying Nation’s ambitions for them in the person of none other than fictional Dalek creator, Davros. 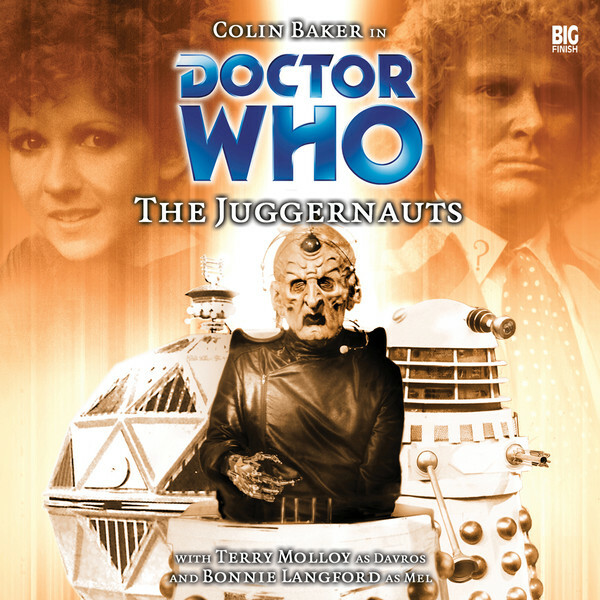 As stories go, The Juggernauts is a fairly straightforward affair – separated in the last moments before a spaceship explodes, the Sixth Doctor and Mel (she of the red hair, the piercing scream and the highly alleged computer programming expertise) are separated. She makes it to an escape pod and crashes onto Lethe, a planet where a research team led by a *cough, cough* friendly old man in a wheelchair just happen to need a whizz-kid computer programmer. The team are building service robots, the ‘Juggernauts’ of the title, and hope to get funding to build them for use all across the galaxy. The friendly wheelchair-bound scientist is Davros of course, using a perception filter to disguise his generally scary features from all concerned – I promise, this is not a spoiler – he’s right there on the cover, for goodness’ sake – and as it turns out, he’s engineering the Juggernauts (AKA the Mechanoids) to be the perfect Dalek-killers, to wipe the pepperpots out of history once and for all and begin again. Nevertheless, he has a couple of battle-damaged Daleks on standby in case anyone happens to need exterminating before the Juggernauts are ready. Which is handy. The Doctor meanwhile has been apprehended by the Other Daleks, the Daleks who don’t subscribe to the Davros-Fan Monthly. They’re in orbit, watching everything that goes on with the development of the Mechanoids, and they essentially recruit the Doctor to do the majority of their dirty work for them, which he more or less does while the potential investors in the Juggernaut Programme come to check out the robots’ potential. Suffice it to say, things don’t go terribly well, with much extermination before tea, and Mel left more than a little traumatised by events on Lethe and her part in them. The Juggernauts is a story that takes two of Terry Nation’s creations and tries, many decades after he gave it a go, to equalise them. It’s fair to say the Big Finish version gets closer than Nation himself did, but it’s a story that also shows off the company’s relative youth when the story was written and produced – the audio has a roughness, the dialogue a slightly over-convoluted tone that sometimes begins to grate. But the idea of Davros feeling in need of a better legacy than the extermination of everything, of him being prepared to create something which many a civilised world would thank and venerate him for – the perfect Dalek-killing entity – and of him wanting to be celebrated, rather than vilified is a compelling one, meaning Mel’s conflict here is particularly heartfelt and appealing to listen to. Ultimately, there’s a Phantom of the Opera metaphor at work in the story – Davros feeling a need for his work to be appreciated, and ultimately aiming to do something that could have positive benefits for the universe (notwithstanding his willingness to upgrade the bejeesus out of the Daleks as soon as he needs a bargaining chip), but the corruption, not of his body but of his scientific soul turning everything to ghoulish, dark, appalling nastiness in the way he seeks to make the Mechanoids what they have the potential to be. The overriding sense at the end of the story is sadness – both at the brilliance of Davros perverted by the scarred scorched-earth lack of feeing for his fellow creatures, and at the lives that were lost along the way to this abortive destiny of the Mechanoids. It’s a sense that’s mirrored in the listener experience – The Juggernauts was a cracking story idea, worthy of Nation himself, but some of the techniques and some of the scripting make it feel not exactly like a story missed or mishandled, but just one that could, some years down the line, have been made so much better by a company more experienced. Bottom line, The Juggernauts will always be one to listen to at least once, because it’s Davros building the Mechanoids, after all. But an all-time favourite? Probably not.